Can anyone give me an update on the status of the L&BR. I know it's out of service, but is there any equipment still on the line? Also, what happened to their 44-tonners, especially the one that ran on the Skaneateles Railroad? Does the MA&N still use the branch between Lowville, Carthage and Newton Falls? Also, do they still go up to Lyons Falls? I believe the Shay is still in Croghan, along with one or two other pieces of rolling stock. I've been told that one of the 44 tonners is in the engine shed in Lowville, but cannot confirm that. There is a 44 tonner in use by the MA&N at Carthage, but I'm not sure where it came from. It might be the other L&BR engine. The only use of the Lowville line these days is car storage. The C&A is also used for car storage. There are a couple of industries switched in Carthage itself, including Slack Chemical. Talk continues of resuming rail service to Newton Falls, but the paper mill is kaput. MA&N has been serving an industry in Lyons Falls, but I don't know the current status. On trips through the area over the winter I never saw any evidence of rail activity there. They do go to Boonville on a regular basis. Does the MA&N still use the branch between Lowville, Carthage and Newton Falls? Point of order here - the line between Lowville and Carthage began life as part of the Utica and Black River (thence RW&O and NYC). The Newton Falls line (C&A) began life as the Carthage, Watertown, and Sackets Harbor, or an extension thereof. I believe the intent was an east-west line across the Adirondacks. The mileposts are numbered from Sackets Harbor. And don't forget, an actual LBR 2-8-0. If you can find it in the yard. 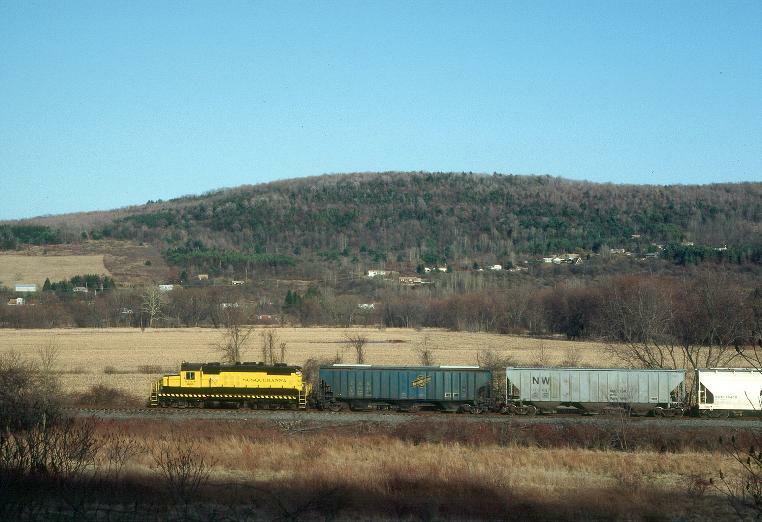 Also, what happened to their 44-tonners, especially the one that ran on the Skaneateles Railroad? The 44 ton (1951) that the MA&N uses in Carthage is the one from Skaneateles. It is the only one operational. The 1950 was sold to a private party but may still be on the property. The 1947 has been out of service for years with a bad traction motor, but at one time was being looked at for return to operation by the Railroad Historical Society of Northern NY (owners of the shay). Only activity on the north end of the MA&N is in Carthage, with Slack Chemical and Climax Paper, the rehab on the Newton Falls line is close to moving forward, just waiting on Jefferson County. I haven't caught them in action since December 2012 but power in Carthage should still be MHWA 2454 and LBR 1951. At that time in 2012 they had borrowed NYSW 3012 to assist in moving storage cars because the 1951 was down with mechanical problems. Is any of this line being repaired, so there is no way to get to CSX at this time ? tree68 wrote: I believe the Shay is still in Croghan, along with one or two other pieces of rolling stock. Yes, the Shay is still in Corghan as of a couple of weeks ago. It needs an FRA boiler rebuild, at least a half-million-dollars worth of work. I've been told that one of the 44 tonners is in the engine shed in Lowville, but cannot confirm that. Yes, the L&BR has a combine coach and a 44 tonner in the engine shed in Lowville, storage courtesy of the MA&N. Lewis County had a half-mil grant to buy the Lowville line and turn it into a rail-trail (after MA&N pulled the rails), and buy the L&BR with tracks. And the frigging idiots GAVE THE MONEY BACK because people there thought that the railbed would be used by snowmobilers and ATVers. Well, once MA&N pulls the rails, that is what will happen regardless. Idiots. So the rails remain there, last I saw and have read in the papers. Talk continues of resuming rail service to Newton Falls, but the paper mill is kaput. Yes, even though the paper mill is kaput, Jefferson County and St. Lawrence County got grant money to recuscitate the railroad, and St. Lawrence County just took ownership of Benson Mines and will try to find somebody who wants to build on the 17 acres which aren't polluted and .... which will have rail service. DECA wrote: Is any of this line being repaired, so there is no way to get to CSX at this time ? CSX still goes to Carthage, which is how traffic for the Carthage businesses is received by MA&N. My travels took me through Croghan today... stopped for a minute to take some pictures of #8 sitting out in the sun. Screw it... not gonna go through the hassle of redoing pictures and reposting them. Wanna see them? Have the admin's fix this 1990's era dial-up modem requirement. I will be up there this weekend to take pictures of the Shay. What are the chances of seeing any trains through nearby Watertown? Benjamin Maggi wrote: I will be up there this weekend to take pictures of the Shay. What are the chances of seeing any trains through nearby Watertown? Saturday there isn't much to see, Q153 tends to run through Watertown before dawn, Q152 doesn't run that day, Q621 can show up mid to late afternoon and Q620 is usually nocturnal. Sunday there is no Q153, Q152 runs through Watertown between 8 and 10, Q621 is again in the afternoon and Q620 at night. "The 1950 was sold to a private party but may still be on the property." The 1950 is now in Maine.